There's nothing we love more than a great party, and this month's Weekend Girl is our new go-to girl for all things fun and flirty. Amy Cheung is the creator of Confetti & Co, and we are absolutely infatuated with her latest endeavour: a collection of unique statement balloons in a variety of prints and colours. 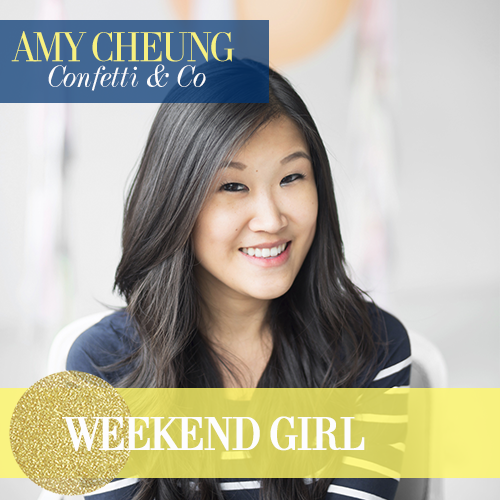 Amy owns the ultimate Etsy destination for homemade note cards and one-of-a-kind balloons. She's known for her whimsical creations that evoke her own personal playful style. We've decided that absolutely no party is complete without a touch from Confetti & Co!